We've featured one of our charitable giving partners every month since we began this blog. We believe giving back is an essential part of building our business and, happily, we're not alone in that! This month, we're featuring The Valentine Project, an organization founded by interior designer Joni Vanderslice of J Banks Design, along with Dr. Richard Vanderslice and Susan Ketchum. The Valentine project was founded by business owners who, very much like us, believe it is their responsibility to take care of the children of the world. They focus on the growing orphan crisis in Tanzania and strive to make a positive impact on the lives of children there. Valentine Project Children's Home opened in 2015. It provides a loving home to twenty orphans, ages three to ten. With a staff of five Tanzanians, including three nuns, a teacher, and a mothers' helper, Valentine Project's Children's Home provides a loving, nurturing atmosphere for the children to grow and learn. Currently we have 20 children, ages three to ten, living at the Valentine Project Children’s Home. Between 2016 and 2017, we added pigs, a cow (who gave birth to a baby calf! ), greenhouses, a field of papayas, a playground, and an infirmary building to the home. We have welcomed a new full time teacher and have sent five children to public school. In 2017, those same five children attended private school for the first time ever. The students were in a class of twenty-five children and in the first quarter, were in the bottom third of their class. By the second quarter, one was tied for first in the class, one was fourth in the class, and the others were in the top half. They were so proud when they showed us their report cards! In the upcoming years, our plan is to continue building, with the expansion to include up to four more homes on the campus. The additional buildings will provide a home for up to 100 abandoned and precious children. The organization strives to create a stable environment, to educate the children, and to encourage sustainability. 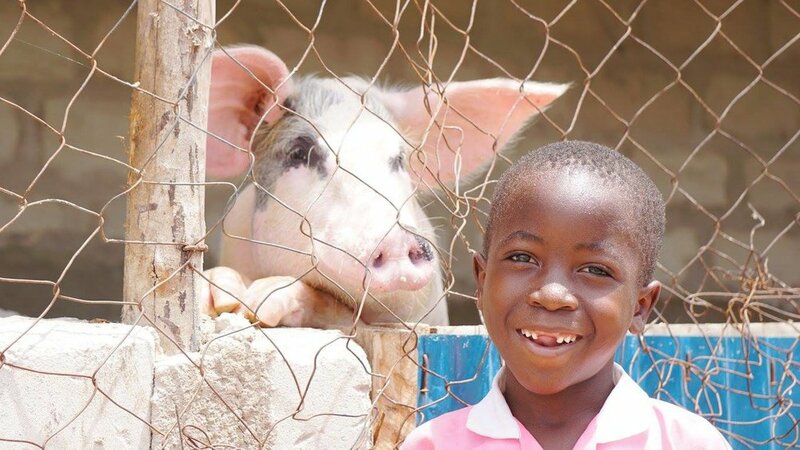 To them, sustainability means self-sufficiency – the vegetables in the greenhouses, the eggs laid by the chickens, and the piglets raised can all be used/eaten by the children and staff and any extras are sold in the marketplace. A good example: the staff recently harvested and sold a bumper crop of cucumbers and took in 200,000 Tanzanian shillings. Of that money, 100,000 Tshs was put back in to the budget and the other 100,000 Tshs went toward purchasing tomato seeds and pesticides for the greenhouse. Valentine Project is 100% funded through donations. We're so proud to contribute towards this incredible cause. To learn more about the organization or to donate, click here.